FireQuery allows you to inject jQuery into any web page. Just click the jQuerify button in the Console panel. Note that page jQuerifying can be also done through Firebug built-in include() command. FireQuery also improves logs displayed in the Console panel. 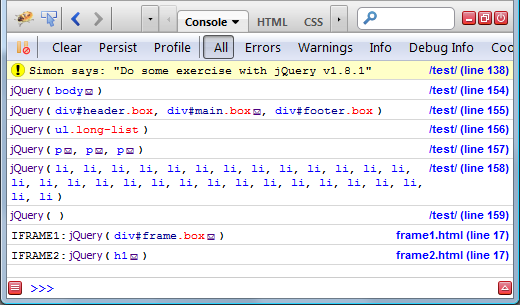 When you use $() (the one coming from jQuery) you'll see that the log is marked as being done using jQuery wrapper. Executing the script in a page (or on Firebug's Command Line) will associate data with the body element. Now if you query for the body element you'll see a little envelop icon attached to the result. Clicking on the icon will navigate you to the DOM Panel where you can see/inspect all details. Finally, you can also use the HTML panel to see the data. There are more features, so check out the FireQuery home page.